Here’s a collection of Low-Carb Stuffed Peppers Recipes to give you some ideas for Weekend Food Prep, and peppers are extra good in the fall! Use the Diet-Type Index to find more low-carb and gluten-free recipes like these. Click here to PIN this collection of Low-Carb Stuffed Peppers Recipes! It has been brought to my attention a few times that some people don’t like peppers, to which I can only reply “Huh?” I do remember not liking peppers too much as a kid, but I’ve been a fan of stuffed peppers now for more years than I can remember. And for the other peppers fans out there, I’m sharing Ten Low-Carb Stuffed Peppers Recipes! And because you can never have too many low-carb stuffed peppers recipes, I couldn’t seem to narrow it down to ten, so there are a few more options after the photos! Be sure to check out those recipes as well! I found a lot of stuffed peppers that were appetizers, but I decided to focus on main dish stuffed peppers, and I found some very creative stuffed pepper options to give you a lot of variety. And I also found some recipes to feature from new-to-me blogs this week, which is always fun. Hope you’ll enjoy trying some of these creative and tasty-looking low-carb stuffed peppers. All photos are copyrighted by the blog that posted the recipe. Just click the recipe name under each photo to see the complete recipe on the original blog. And for those in the U.S., happy three day weekend! Definitely Cheesy Stuffed Poblanos with Ground Turkey from Kalyn’s Kitchen are one of my favorite stuffed pepper variations; this is just slightly spicy but filled with flavor. I also love the idea of these Turkey and Feta Stuffed Peppers from Eat Live Run because, FETA! And the other Greek flavors don’t hurt either. Low-Carb Stuffed Peppers with Beef, Sausage, and Cabbage from Kalyn’s Kitchen make enough that you can have peppers again later in the week, and these are delicious! 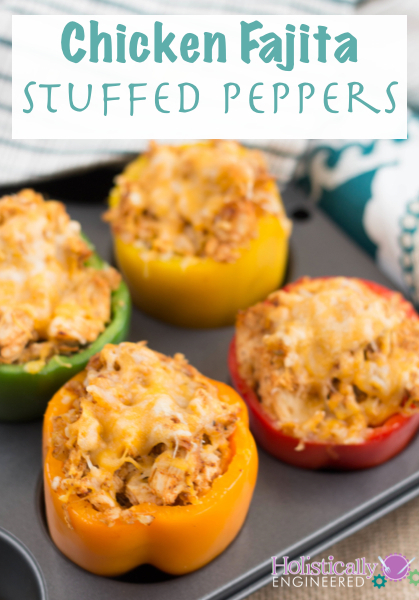 Cauliflower Stuffed Peppers from Food Loves Writing are loaded with cheesy goodness! Low-Carb Stuffed Peppers with Turkey Italian Sausage, Ground Beef, and Mozzarella from Kalyn’s Kitchen are a favorite that’s been really popular on the blog. Beef and Spinach Stuffed Peppers from Aggie’s Kitchen sound easy to make and once you buy the peppers and spinach, you probably have the other ingredients for this one. Low-Carb Sausage and Pepperoni Pizza-Stuffed Peppers have been a huge hit on Kalyn’s Kitchen! Chicken Fajita Stuffed Peppers from Holistically Engineered sound easy and delicious! Low-Carb Cauliflower Rice Southwestern Stuffed Peppers with Turkey and Poblanos from Kalyn’s Kitchen have lots of delicious southwestern flavors in an unusual combination for stuffed peppers. Philly Cheesesteak Stuffed Peppers from Low-Carb with Jennifer definitely look like a great dinner to me! More Tasty Low-Carb Stuffed Peppers! Sausage and Cauliflower Rice Stuffed Peppers from Jennifer Banz use flavorful Italian sausage. Cheesy Beef-Stuffed Poblano Peppers from An Edible Mosaic have some of the same flavors you’ll find in Chili Rellenos, but there’s no fried batter on the outside! 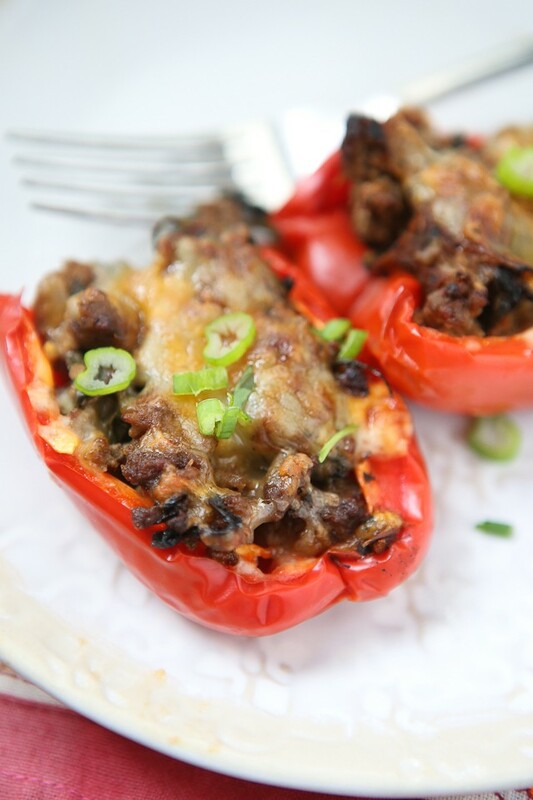 Philly Cheesesteak Stuffed Peppers from Peace Love and Low Carb will be a winner with Philly Cheesesteak fans! Low-Carb Stuffed Peppers with Ground Turkey look easy and tasty at Glue Sticks and Gumdrops. White Lasagna Stuffed Peppers at Joy Filled Eats have all those lasagna flavors that are so good. Check out Recipes Round-Ups to find more low-carb round-ups like this one. See 50 Great Low-Carb Slow Cooker Recipes at Slow Cooker or Pressure Cooker. See 50 Amazing Low-Carb Instant Pot Dinners at Slow Cooker or Pressure Cooker. Thanks for your support and Happy Blogging. Have you experimented with any of these recipes in a pressure cooker? My husband & I love your sausage ground beef, & mozzarella stuffed peppers, and I’m trying to get all our favorites in “Instant Pot” recipes so I can make them quickly after a long day. Sorry I haven’t made stuffed peppers in the Instant Pot but it sounds like a topic I might want to look into for my Slow Cooker or Pressure Cooker site. I’d love to hear what you think if you try it. Thank you so much for including my recipe! Put me in the I LOVE PEPPERS group! Love.them.all — and they are so good for you! To top it off, they are easy to prepare, and can be used in a lot of dishes! My daughter mixes a little cayenne with cottage cheese and roasted sunflower seeds, stuffs it in half a red bell pepper and eats it like a taco! Yummy! Yaay, so glad to hear from another peppers fan! And I love your daughter's idea. There are so many yummy ideas to try here – I love stuffed peppers and these low-carb versions are right up my alley! Thank you so much for including me! Faith, my pleasure! I love Poblanos so your recipe really caught my eye!